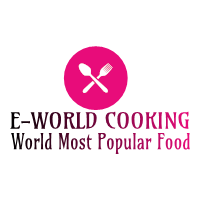 Dragon Chicken Recipe ~ E-World Cooking-The World Most Popular Food. Today we are going to do a Chinese dish Dragon Chicken. We have been doing traditional Indian dish since long.so let’s have a change. It’s a very easy recipe. It's spicy, tangy and sweet in taste. All of you do try it out. 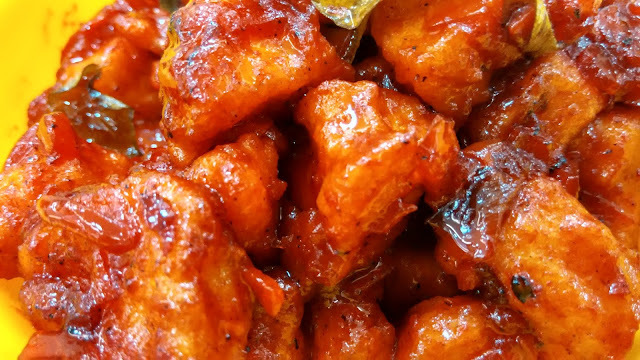 When you like it don’t forget to like and share.so without any delay lets stats how to make our tasty and easy Dragon Chicken. Let’s begin to make the dish now. cashew nuts-1o to 15 nos. I have taken 250 gm. of the boneless chicken breast here to make the dragon chicken. We usually get a pack of 500 gm. I have taken half of it here. You can even use the breast part of the fresh chicken. We always make dragon chicken using the breast part of the chicken. Now let’s wash and cut it too lengthy pieces. I wash it using 2 tbsp. vinegar and 1 tsp. salt. I soak the chicken in this for 10 minutes and then wash it well. Now let’s cut it lengthy. Kids like this dish very much. It’s nice to have with fried rice or noodles. While cutting the chicken makes sure you don’t cut them very thin, it won’t taste very good.250 gm. of chicken this is a quantity for 2 people to make for 4 people, you can use 500 gm. chicken. I always use fresh chicken. I don’t like frozen chicken. I have washed the pieces and kept it ready. Now let’s marinate these pieces for dragon chicken. I am using standard spoon here. Many say they don’t understand the measurements.3 tsp. is 1 tbsp. 15 ml is 1 tbsp. 1 tsp. is 5 ml. So in a bowl, I am taking 2 tbsp. of cornflour, 3 tbsp. Maida. If you don’t like maida you may substitute it with wheat flour. Next, add 1 tbsp. garlic paste. I used little water to grind it well. I took 1 whole garlic and a piece of ginger for this. Next is 1 tbsp. all-purpose soya sauce. There is dark and light soya sauce. If using the dark, add just 1 tbsp. That would be thicker and saltier.so always check and buy the all-purpose soya sauce. Or adjust your measurements according to the sauce. Mix all these very well. We shall add salt only at the end because the sauces have salt. Next, add 1/2 of beaten egg. For 250 gm. chicken 1/2 of the egg would do. The egg helps in the marination of the chicken. Now add some chili paste. You can also use Kashmiri chili powder for color and taste. Adding 1 tsp. chili paste or 1 tsp. Kashmiri red chili powder or normal chili powder. Mix it well, lastly add 1/2 tsp.of pepper powder. This is the standard measurements spoon. Mix all very well. I have not added any extra water to this. Now check the taste if salt is less then add salt as to taste and mix well. Let’s add the chicken to this and keep it aside for at least 30 minutes. Fork helps to mix all the masala well. Now let’s add the chicken pieces. Please ensure all the chicken pieces are properly coated. We haven’t added any extra water to this. The egg is the binding here. This is done, let’s chill it for 30 minutes. Now after 30 minutes heat a pan to fry the chicken pieces. I am using sunflower oil here. Once the oil is hot, let's add the pieces to it, the oil shouldn’t be very hot where the smoke comes. If so, just keep it aside in another stove to cool a bit. Medium head is what we need. Else the chicken won’t get cooked and the outside will get burnt, I always mention this please be careful. Kids like these fried chicken or dragon chicken too. You can give them as snacks in their tiffin box. Some wouldn’t like the spice of sauce, they would like it crispy. After 2 minutes we shall turn this over. Later check one chicken or make sure it cooked well, Only then remove it from the fire. Let’s transfer the cooked ones to a strainer. We just to have to fry them till it’s done and not very fry them the crispy effect will not be there if it’s overdone. It will become hard and difficult to eat when it over cooked.so it should be removed golden in color. Remaining all the chicken pieces fry in this similar way and keep it aside. I have sliced all the three color Capsicum and a small piece of carrot to lengthy strips But all should be thin. Carrots are optional, I have added it for good color. I have chopped a small onion and celery for this. When I make Chinese item I mix all the sauces in a bowl together and then add it to the dish. This would make work easier. I have taken 3 tbsp. tomato sauce, chili paste or Kashmiri red chili powder or normal chili powder as you need, add soya sauce, 1 tbsp. hot chili sauce, you get them all the supermarkets. Now Mix all the sauces and keep it aside. I am adding 1tsp. sugar also to this. We shall add salt to this later. We need one glass hot water too for this. After keeping all this ready we shall start making this. I always say that it’s better to use sesame oil for the Chinese dish. That gives the correct flavor to the Chinese dish if you don’t like its smell you can use any oil you like. But never use coconut oil for the Chinese dish. To fry some cashew nuts, I am using the oil I fried the chicken. Take some oil and use 10-15 cashew nuts, there is no special amount for this. Fry this till it reaches golden color, fry this and keep it aside we will be using it at the end. If we add these cashew nuts at the beginning, the crispness will go. The cashew nuts are ready. If you want you can use this oil itself or sprinkle some sesame oil at the end. You may do whichever you wish. I have discarded that oil and taken 1 tbsp. sesame oil. You can use sunflower oil too. Add 1tbsp. Ginger garlic pastes to the hot oil, it may splutter because of water content so be careful. Sauté this well on high flame then add the onion and celery, Sauté till the onion transparent. Add the celery which is optional. Add a little salt, be careful while adding salt because all the sauces have salt. I am adding some red chilies now, sauté all this well then add the sauces .you can make this a gravy or dry dish too, its depend up to you. Accordingly, you have to add the remaining items. I adding one glass hot water to this, let me taste the sauce. Salt sweet spice and all are there. If something required then add according to taste. Once it begins to boil well, we shall add the chicken pieces to it. I need a thick coating so added one glass water. When It has boiled well, taste is perfect then add the chicken pieces to this. Let's stir it well and add the Sliced Calcium and carrots to this. Cover it and cook it for 5 minutes on medium flame.it shouldn't get overcooked. Now our dragon chicken is ready, it has absorbed the sauces well. Lastly, add some cornflour mixed in water to the chicken. This is for all to combine well. I had taken 1 tbsp. corn flour in one cup water, I added 2 tsp. of this mix to the chicken, now it thickness and mix well. Otherwise, the pieces and vegetables would stand separately. This should be cooked for a while for the raw taste of corn flour to go. Now we can only adjust the test of salt and sugar. Sauces should not be added again, the raw smell won’t go. Usually, in Chinese item don’t have coriander leave but they are added in the Indo-Chinese dish. I am doing this the Chinese way so don’t use coriander leaves. Lastly, add the fried cashew nuts to this. So our dragon chicken is ready, it’s very easy to make. Add the cashew nuts at the end or just when serving. Only then it will stay crunchy. Finally, I am sprinkling sesame oil over it for good flavor, this is optional. Hope everybody has liked this dish, all of you do try it out and let me know your feedback.